WAG WAG! 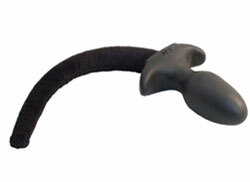 You better stop, sit and beg for the latest amazing puppy tail plugs from BON4 at Black Body. 100% silicone, shaped to perfection and just the right consistency for a bouncy wag, these tail plugs are the highest quality pup toy that you can lay your hands on! They come in different sizes to suit any pup, from a Terrier to a fully grown Wolfshund. These Dogtails have a ‘fur’ coated tail as added feature; the tail part is covered in velvet so it looks more natural. Click on the picture to view all sizes.